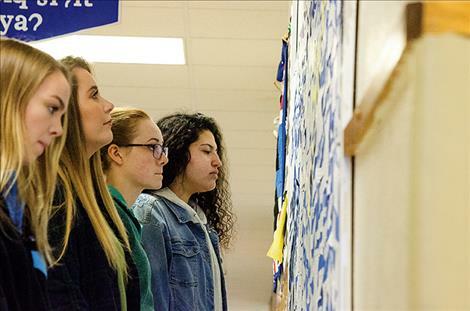 Sophia Tolbert, Leila Marsh, Brooklinn Hunt, and Addison Arlint read comments on a bulletin board where students anonymously posted comments about their experiences with suicide and suicide prevention. 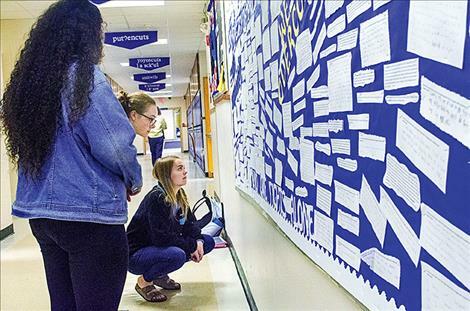 Students share experiences with suicide and mental health issues on a bulletin board. A group of students at St. Ignatius High School have organized to start conversations about mental health and suicide in their school. Their organizing was a reaction to the many completed and attempted suicides that have happened in the county over the past year. Students have had enough direct and indirect experience with the issue to know there is a problem. Addison Arlint, a sophomore, said the students felt they could start solving the problem within their own peer group. “We know what helps us,” she said. The group began talking about the issue last year. Those talks recently culminated in an anonymous question and answer project designed to broach the difficult subject. The students decided to challenge the lack of dialogue about suicide by starting a conversation within each grade level in different classrooms and spaces at the school. They figured if society made it uncomfortable to talk about these issues, then society could also make it comfortable to talk about. 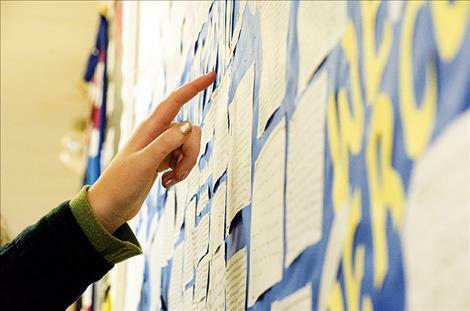 Shannon Redmond, the school’s counselor, helped the group develop questions about suicide that students could respond to without putting their name on. About 130 high schoolers participated. Students were asked how suicide and mental health issues impacted their lives, and if they thought about suicide, how did they get through it? The answers were displayed on a bulletin board in the high school without names. “We needed to keep talking about this,” said senior Leila Marsh, one of the project organizers. She said she wanted people to talk about suicide prevention and mental health issues until they were so tired of it that the subject becomes a common part of people’s conversations, instead of something people are afraid to discuss. She believes talking about the issue with compassion can help make it easier for people to ask for help. Making it easier to talk about suicide and mental health issues was the goal for the group, but they also discussed what to do next when the conversation begins. The group said being a teenager isn’t easy with the pressure not to fail, to find the right career before they even really know themselves, and although social media has it’s benefits, it’s also full of images telling them they need to be a certain way to be good enough. The group seemed to take a collective breath before agreeing they wanted to keep working on the issue of awareness to let other teenagers know that people care and they aren’t alone. “We may not know you, but we care about you,” Leila said. She said teenagers across the reservation are doing projects to help each other deal with some heavy issues, and she wants the work to continue. She mentioned the videos the Arlee Warrior basketball team created in an effort to bring awareness to the battle against suicide.